The Chadron Middle School History Bee took place on January 13 in the Chadron Middle School library. 19 students qualified for the event by having the highest pre-test scores in the school. Students were asked a series of history questions and the 10 students who answered the most questions correctly advanced to the testing round. 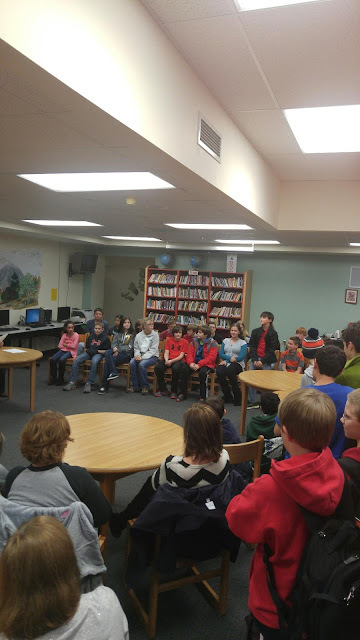 Congratulations to BrendiLou, Wren, Dylan, Michael, Hannah, Hunter, Hannah, Carter, Garrett, Tate, Grace, Kayley, Cooper, Luke, Spencer, Cody, Britton, Spencer, and Natalie for qualifing for the Bee. The top 10 finishers were: Wren, Michael, Hannah, Hunter, Garrett, Tate, Kayley, Spencer, Britton, and Spencer. They will take the History Bee test on Friday, January 22nd at noon. We wish them good luck!